Jesus Adolfo Delgado Duarte (fourth from the left) with his coworkers. Courtesy of Madelin Calderon, who is the first person from the left. 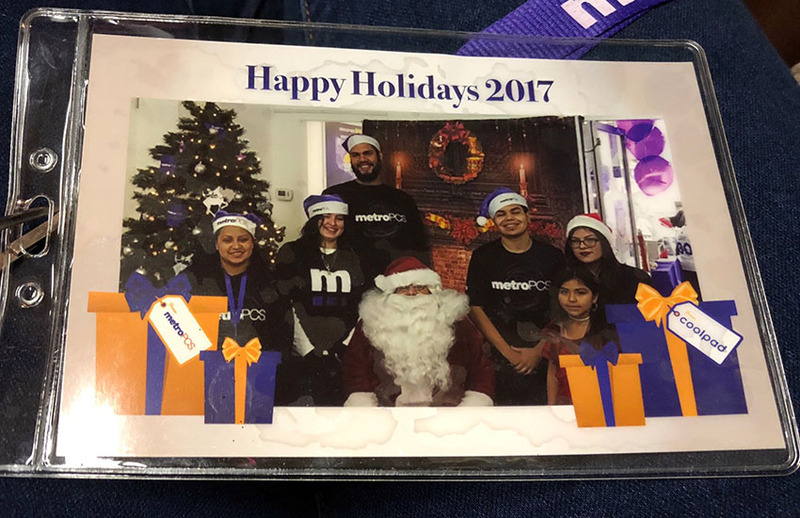 On Tuesday night at 8:40 p.m., 19-year-old Jesus Adolfo Delgado Duarte and his co-worker closed up shop at the Metro PCS store at 2380 Mission St., near 20th Street. “My Uber came and so I left,” said the co-worker, Madelin Calderon. Delgado stayed behind. “He was waiting for a friend,” she said. Two hours later and two blocks away, Delgado became this year’s first Mission District victim of an officer-involved shooting. As in the vast majority of police shootings, what happened will take officials years to determine. 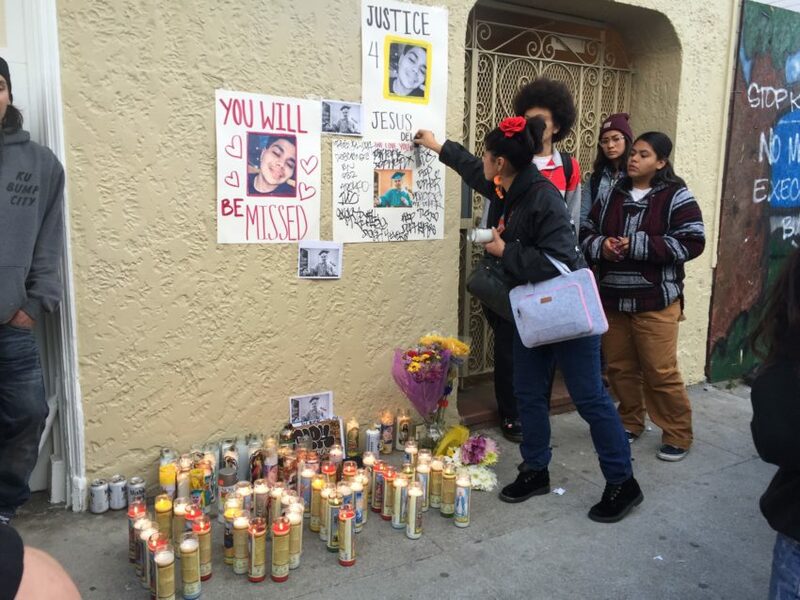 But, as quickly as a makeshift memorial went up in front of 626 Capp St. — the building in front of the site of where the shooting occurred — the questions and protests began, as friends marched Wednesday evening to the Mission District police station in protest and remembered their friend. Some 15 minutes before the shooting, 18-year-old Maria Zaragoza, who attended the memorial and protest, said she saw Delgado as she parked her car on 26th and York. Delgado and a group of his friends were sitting in a car, she said. She didn’t know what he was up to. “I just seen him,” she said. Soon after Zaragoza saw her friend, police spotted him two blocks away from his workplace in the trunk of a car, a suspect in an armed robbery incident. 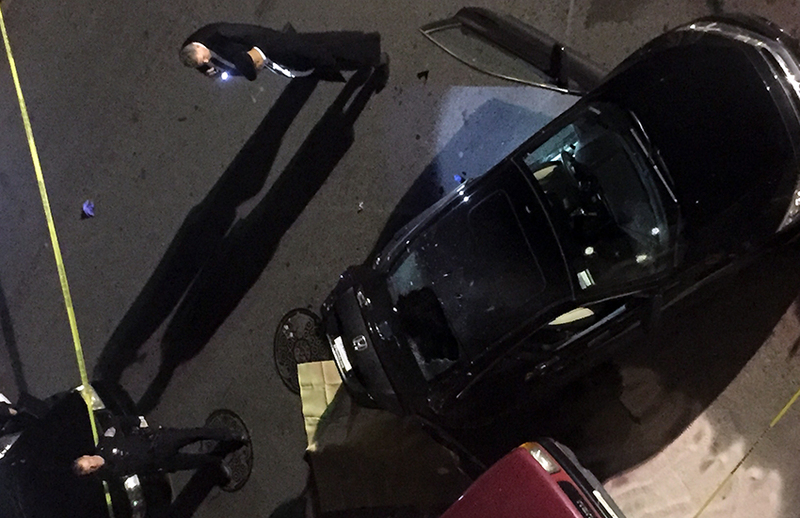 Just minutes before, police had arrested the driver of the car, a black Honda Civic. Police noticed someone in the trunk and surrounded the car on Capp Street near 21st Street. In a video of the incident, police can be heard asking Delgado, in Spanish, to show his left hand. Then, a barrage of shots can be heard. He was pronounced dead at the scene. As readers have pointed out, another video appears to show shots coming from the trunk, but police have not confirmed that the victim shot at police. 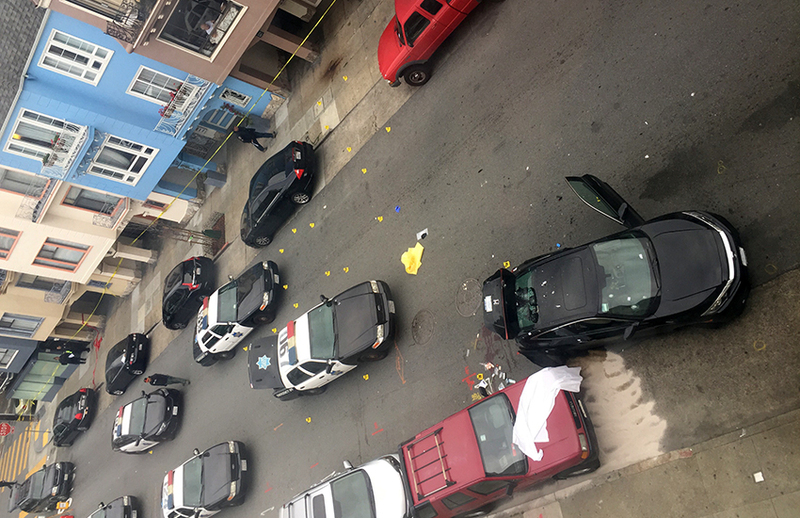 The SFPD have said only that officers found a handgun in the trunk of the car. They arrested 19-year-old Victor Navarro-Flores, the driver of the vehicle who exited the car before the shooting, as well as 18-year-old Christina Juarez, who got out of the car after police shot Delgado. Each was charged with two counts of robbery and one count of conspiracy (updated: 5:03 p.m.). This is still an active investigation and information is still being gathered. We are working at this time to put together a Town Hall so that we can provide the media and public with information regarding the incident. Delgado was born in Mexico on Christmas Day in 1998, and grew up in the Mission District near 22nd and Bryant streets, where friends said he was living at the time of the incident. He was undocumented, many of his friends said, and his biggest fear was being deported. Delgado started school at Bryant Elementary, and later went to Aptos Middle School. He spent some time at John O’Connell High School, but graduated from Life Learning Academy Charter High School on Treasure Island, according to Calderon and other friends. He had been working at Metro PCS for nearly a year. When told that officers found a handgun in the trunk, Calderon asked, “But if he didn’t have it in his hand, why would you shoot? “He was young,” said one of his friends standing in front of a makeshift memorial at 626 Capp St., where the shooting took place. “Yesterday (Tuesday) he seemed really good, helping a lot of customers,” Calderon added. At the memorial, friends remembered him as bright and a lot of fun. 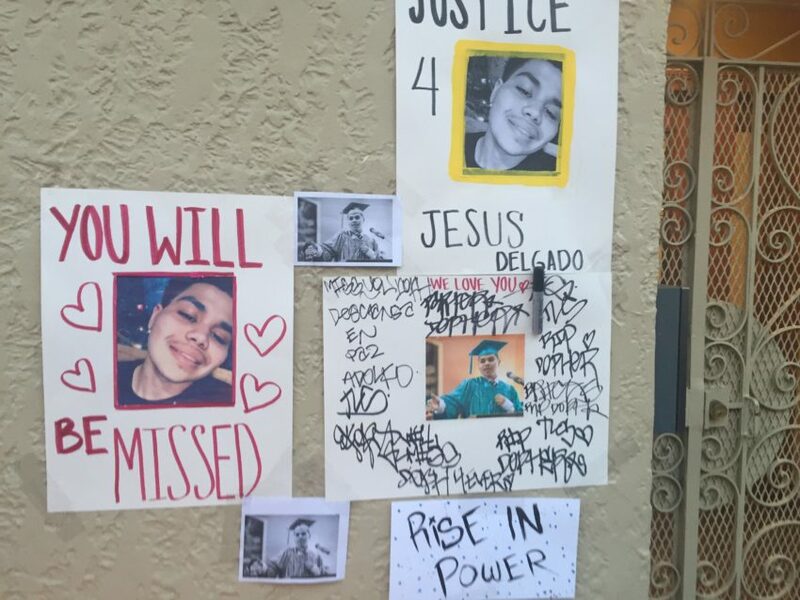 One friend, a 19-year-old who said he attended John O’Connell with Delgado, said Delgado loved graffiti and street art, as well as riding a bicycle around the Mission. “He was a great person, the life of the party,” he said. Others agreed that he was a center of gravity, a force that always had the room in stitches. Navarro met Delgado in the third grade at Bryant Elementary. She said Delgado and her brother were best friends. He was at her house regularly to visit her brother. “They would hang out, come over to the house and eat,” she said. Back at the Metro PCS store on Mission Street, Gomez, store manager, said he had trouble sitting still in his office. The scene after the shooting. Photo by Margot Goldstein. The scene Wednesday morning on Capp Street. Photo by Margo Goldstein. By Wednesday afternoon a memorial was up at 626 Capp St. Friends and community members gathered there to remember Delgado. Photo by Julian Mark. 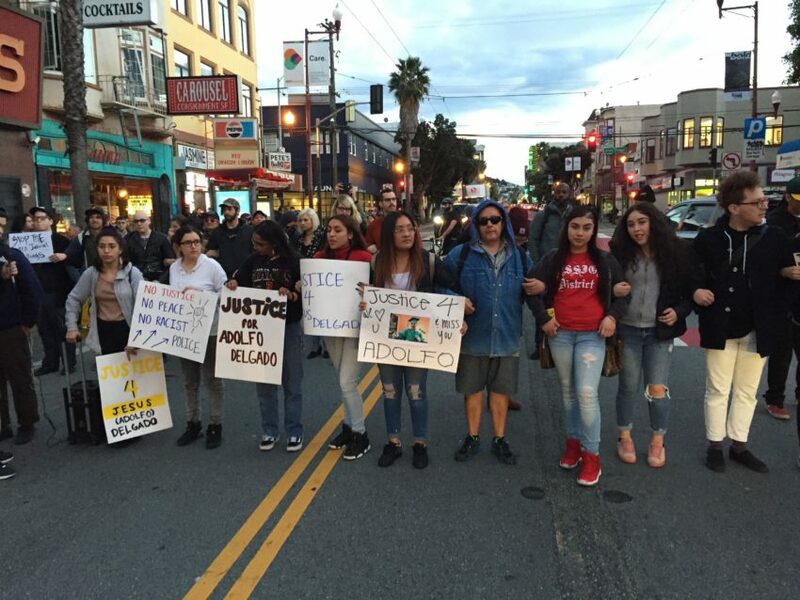 At least 100 community members marched down Mission Street, blocking off intersections and ending their journey at Mission Police Station. Photo by Julian Mark. 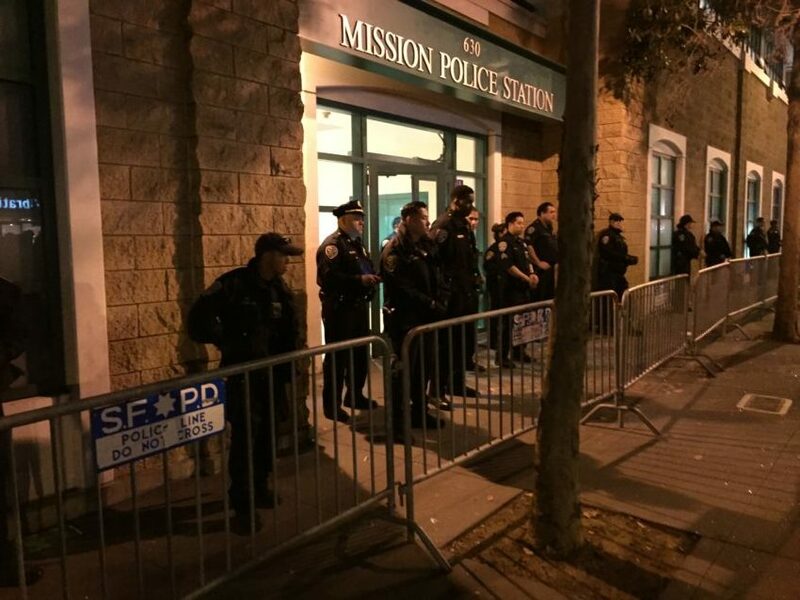 Police guard the station as protesters chant, sing and give speeches in the middle of Valencia Street. Photo by Julian Mark. Chirag: I’m unclear what you mean about the media sensationalizing this. The SFPD’s statement is included. It does not have much information, but I expect there will be more soon. It’s really unclear what happened. There are some witness videos and I’ve seen two different interpretations of the videos – neither are convincing because they are not close enough. Maybe there is more video that will come out. The police might also release the body camera footage – although it would help if they actually walked viewers through it rather than just releasing it without comment. What’s unconvincing about the CBS report? Video seems to show pretty clearly that Delgado shot first. I would be reluctant to say exactly what this shows because it happens so quickly. And, the SFPD has not said that the victim fired shots or even that the victim had the gun in his hands. In other officer-involved shootings, they have immediately said the victim had a knife in hand or was coming at them with a knife or that the suspect was armed. Here the statement says “A handgun was located in the trunk of the vehicle.” But, I can also see why you might assume that the victim fired shots. For us, however, it is important to get that confirmed. I appreciate you writing a post that humanizes the man shot by the SFPD. If you watch the difficult to watch video… about 40 seconds in, Adolfo points a gun out of the trunk and fires at the police. It’s pretty clear. There are two cell phone videos of the shooting in the media. One shows the shooting from the perspective of a couple of stories above the shooting. One shows someone recording it at street level. The street level recording shows Adolfo shooting a gun. Trofim: I am not saying that you are wrong. I simply don’t know. I can guess, but I don’t see any harm in letting the police confirm or give more details to explain what happened. We went back and asked the SFPD again because clearly a lot of viewers like you are convinced by the videos. I hesitate because I know that in covering police shootings, the police will generally say immediately when the victim fired or attacked them. Perhaps there is a reason they are waiting. I simply don’t know for sure, but we have linked to all the videos and we have given the police statement and an updated statement. We will continue to follow this and update the story. What’s clear if you’ve already painted a violent criminal as a victim. That video shows he shot first. Jay: We cannot report that he shot without confirmation. We went back to the SFPD to ask for confirmation or clarification. We told police that various media outlets were reporting that it appeared the victim shot first and asked for confirmation. I have updated the story to show their response, but here it is again. Justin: I agree that the video is very clear. The shooting starts with flash from the trunk of the car. It is sad that someone who actually seemed to be getting his life together got messed up in an armed robbery etc. nice piece, paints a a picture of a person rather than just a story about another statistic. I went to O’C and grew up in the Mission, and this is close to where my family lives now. Too close to home. He robbed someone at gun point, hid in the trunk with a gun, a witness said he saw a muzzle flash from the trunk first. This video clearly shows him shooting at police offers. There’s a spraypainted message at the scene that says “stop killing us.” There should be a message that says” stop robbing people at gunpoint and shooting at the police. The people defending this adult criminal should be ashamed of themselves. Well one thing I agree with here is that is the wave of robberies and break-ins plaguing the city are often being committed by young people who do not fit the old mold of your typical armed robber. They drive relatively new cars, travel in groups, evade detection by looking like ordinary kids, etc. And they are very often employed, living with their families and clean cut looking local kids. But that does not negate the simple fact that they are endangering themselves and others and taking enormous risks. I was attacked by one of these kids for my i-phone 20 months ago and I’m still recovering. Its always tragic when the worst happens but how can anyone deny the simple fact that these people were engaged in extremely violent, dangerous and evil behavior. When you do that, bad things happen. The black honda civic he was may be the one I saw someone from the passenger side jump out, smash a window in an SUV and steal a bag from. I helped the owner report it to the police at about 8:15pm on Tuesday, just before they apparently pulled that guy over. I’ll be the first to say there is a problem with SFPD shootings. But the truth is there ARE times when police have to use their weapons. Such as with an armed criminal, hiding in a trunk, given ample time to surrender their weapon and SHOWN ON VIDEO to fire first at the police. These protests destroy the credibility of those who truly want to shine a light on real injustices. I would like you to put more attention to the video and see that the first ones to shot was the police and also have someone to translate you what the officer said in Spanish were they clearly said “we will shoot at you again”!!! I think that when you say “the first one to shoot was the police”, you’re referring to the fact that the police fired a non-lethal round (a bean bag?). That looked like it hurt him, but he returned to his original position in the trunk and still didn’t show his second hand. I really don’t think that counts as “shooting first”. When he did move, it was clearly aggressive and intended to surprise. You can see a gun and hear the shot go off, and see the muzzle flash coming from Adolpho before the cops open fire. I strongly believe there have been some innocent victims of police violence in SF. This was not one of them. Nope, try again. There’s video which clearly shows Jesus shoot a round out of the before he is shot. The officer said “the shoot again” after a non-lethal bean bag round was shot after she spent a minute telling Jesus to get out of the trunk and keep both hands in view. He kept on dropping his left hand behind his back which all the officers facing him would then tell him not to. So sorry that a young man had to lose his life but why was he here illegally? He had plenty of time to become a legal citizen! And why was he out robbing people and carrying a gun? I am sorry but this was his fault entirely and not SFPD. He was an undocumented criminal. The KCBS video clearly and unmistakably shows him popping open the trunk and firing at the police. And after that the police made absolutely no effort at descalation, no effort to open a dialogue who the man who had just fired at them. Nothing. But seriously, the video could not be more positive for the police. It includes them asking him to surrender in Spanish, BUt no matter, the police killed a person of color. Hence they are wrong and the gunman was innocent. It’s truly depraved that one would defend this clearly violent and psychopathic criminal, and paint him as some sort of a victim. What kind of age are we living in? Based on your logic, Mission Local, I wonder what your position on climate change is. Should we wait for my scientists to weigh in? You should really add the CBS Video posted by Justin to the main body of the story. It seems pretty crystal clear what happened in that video. If you’re involved in an arm robbery and then shoot at the police, what do you expect to happen? Thank you SFPD for risking your lives today. I’m thankful no innocent victims were hurt. On a sidenote while I’m glad there is video evidence of exactly what happened, be careful out there people! it’s not worth risking your life to get a video! What bothers me so much about this article and other similar articles like it in Mission Local is that many of your stories seem to have the same narrative: All suspected criminals are victims, and the actual criminals are the SFPD. You spend so much time canonizing people who generally don’t deserve such regard, and very little time reporting on *actual* victims in the Mission. Please consider writing articles about people who have had their cars broken into/stolen multiple times a year for years. Write follow-up articles about the victims of the various stabbings/shootings/attacks in Dolores Park last year. Write about the neighbors who struggle month after month to get help from the city in dealing with a problematic individual who harasses all of their children, defecates on their front steps, and does drugs in front of their homes. Write about the chronic illegal sidewalk sale issue that blocks access for wheelchair users and baby strollers alike, and leaves tons of trash and detritus behind. Write about long-time neighborhood businesses like El Rio, Xanath, and Ali Baba’s Cave BEFORE the story is about how they’re leaving the neighborhood. Write about the disappearance of LGBTQ+ culture from the Mission. Stretch yourselves and write about young millennial techies who moved to SF and this neighborhood, only to be told day in and day out that they don’t belong, aren’t welcome, and aren’t liked, how that effects them psychologically. Try to write about this WHOLE neighborhood, about EVERYONE here, not just one select demographic. Clearly, Delgado was a suspect in a robbery and the SFPD arrested two other suspects in the same car without incident. This is clear from the article. The article does not attack the police. We have included their statement and we have repeatedly asked for clarification on the video. Police have their reasons for not confirming that Delgado fired shots. Perhaps it is just best to wait until they are ready to make a full statement about what happened. In the meantime, readers are free to draw their own conclusions about what happened. We need confirmation. In the meantime, his friends and family are grieving. Delgado grew up in the Mission. He’s dead – perhaps because of a stupid decision. The article is not meant to exonerate anyone or to blame anyone. It tells the story of how quickly one’s life can change. We do try to write about the whole neighborhood and we have written on many of the topics you suggest. Could we do a better job? Always. I think it is really odd that you insist that you need “confirmation”; Are journalists not allowed to view and interpret video that they see? And Frankie is correct; the article is very slanted. Lot’s of quotes from people blaming the police — most of them completely nonsensical and at odds with the facts. Not much from the other side. Were you really unable to find anyone who supported the police? Did you try? Let me get this straight…. here illegally, suspect in an armed robbery, hiding in a trunk, possession of an illegal firearm, given minutes to comply, in english and spanish…. and then clearly shoots at officers! ?… Sounds like perfect justice to me. I’m happy no SFPD were hurt doing their duty. At a time when so many young adults in this country are fed up with guns and gun violence this young man chose the opposite. Life is full of choices and unfortunately this young man made a decision to pick up a gun and commit a robbery that night. We hear justice for Jesus, but what about justice for those he robbed at gun point and if you follow Mission Local you will read that there was a series of armed robberies here in the Mission lately. Was Jesus and his accomplices responsible for these series of robberies? We can only speculate pending the investigation. Life is full of choices, Jesus could have made the decision to surrender and step out of the vehicle and he would be alive today. Instead as the video clearly shows Jesus opened fire first which led to his death. There is no one to blame for Jesus Delgado’s death but Jesus Delgado. You live by the sword- you die by the sword -you live by the gun-you die by the gun. One of the problems I have with your approach is that you paint an eloquent picture of Mr. Duarte as a happy, normal, hardworking, fun loving young man, without ever raising the question “How did he end up in the trunk of a car with a gun while it was apparently being used in an armed robbery? Why would he then decide to shoot it out with the police against all odds and common sense?” Did you probe anybody who knew him if, maybe, he used amphetamine or methamphetamine? That might have have explained a lot. The ME’s toxicology report will tell us. However, they take time and by then, will the news cycle have moved on? Moreover, like the Chronicle, you express no journalistic interest in humanizing the victims. Who were they? Were they traumatized? It’s like the Chronicle’s coverage of Mario Woods. What happened to “Jacob” who he slashed and, according to Vivian Ho’s e-mail to me, moved out of SF in fear of his life? No reporter seems to have asked why Kieta O’Neil carjacked a California Lottery van of all things. How’s the woman who was driving it doing. I suspect these questions relate to why cops view the SF press as unfair and hostile. Greg: Yes with more time we could paint a fuller picture. We’re reliant on who will speak to us and we got to quite a few people to talk about him. To me, the whole piece raises the exact question you pose – How does he end up in the trunk of a car? The article doesn’t answer it, nor could it in a day’s worth of reporting, but we were able to talk to the person who supervised him as well as his friends. And yes, we will know more in time from the investigation. It doesn’t seem helpful for the press to jump to conclusions or to speculate. I don’t feel hostile toward the police and we have spent a lot of our time in the last year covering the police and how they work. Lydia: I look forward to your follow up stories as more information becomes available and time allows more in depth reporting. Video clearly shows Delgado opened fire on the police. Stop memorializing a criminal. What is wrong with you people? I hard the commotion from my bedroom. I heard 1 distinct shot, followed by a millisecond of complete silence & a borage of shots. In my opinion, this one time, the Officers did their job. The guy in the trunk made a series of bad choices that evening. His conduct could have cost my neighbor’s life, as a bullet landed on his couch, on the spot he would have been sitting to watch tv, if he was home that evening. This shooting is on the 3 people that were in that car that evening. being a person who: “came to the U.S. as a child and grew up and worked in SF’s Mission”, or a “really nice, always happy, laughing.” person, and at the same time being a violent felon and potential murderer are not necessarily mutually exclusive. many criminals live multiple lives. i humbly suggest that the story missed by ML in their rote and predictable rush to exonerate him as a “victim” and disparage the police is: “why is a reportedly nice and hard working young man out with his crew robbing, endangering and terrorizing his hard working mission neighbors with a gun after work?”. i believe that is a story worth researching and telling. IMHO, a very scared kid with a gun (like a very scared cop with a gun) can lead to terrible ends. We see it over and over. I look forward to the day when humans are not living in fear of each other and armed with guns. Anita, Good point. But why would a reportedly happy, employed 19 yr. old feel the need to be involved in an armed robbery in his neighborhood? This does not strike me as a typical activity with friends after a day of work. And if it’s true that he did live in fear of being deported, would committing a crime be on his mind? Something doesn’t add up. I look forward to the continued reporting by Lydia Chavez to help explain. He robbed pedestrians at gunpoint, he fired a shot at police, he’s in the country illegally and we’re supposed to feel bad that this thug got what he deserved ?